BlytheLife.com » Interview with Heather of Claribari Blythe and Giveaway! 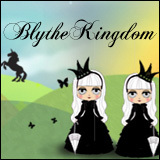 Interview with Heather of Claribari Blythe and Giveaway! I had a blast interviewing Heather! You may know her better by her username, Claribari, or even by her Etsy shop name (Claribari Blythe). 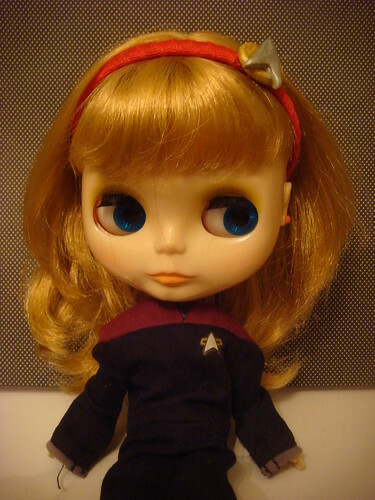 There are a few important things you should know about her: she designs fantastic headbands and she loves Blythe. She also sews and is this week’s addition to the March Talent Showcase so I’m really excited to share with you the interview she did with me! Hi Heather! What can you tell us about yourself? I am a 25-year-old wife, mother, and Blythe-lover. I have a degree in music education, but I have never had a job teaching. I work as a kitchen specialist at IKEA, and I absolutely love it! My hobbies have always revolved around the arts; I enjoy sewing, crocheting, scrapbooking, and music. 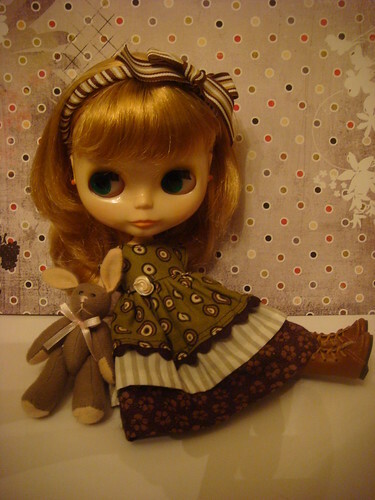 I first discovered Blythe in Willynillywaterlily’s blog. She makes amigurumi creations as well as Blythe fashions. 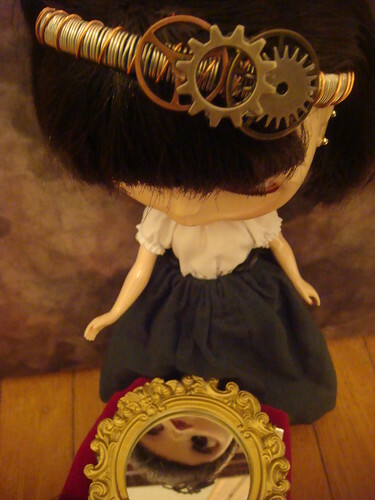 I started reading her blog to follow the cute ami stuff, and I kept seeing this CREEPY looking doll. After a year or two I became fascinated with said doll, looked her up, and then obsessed over buying one until I finally did. I fell in love with my Cassiopeia Spice the moment I saw her, and now my hobby is an addiction! 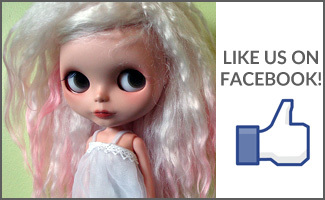 What was the first thing that you made for Blythe? The first thing dress that I made for Cassie was from the Puchi Collective’s free patterns. I made her two little “Blythe Party Dresses.” The one is a little loose, and the other is almost too tight; but not bad for being made before Cassie even arrived! Where do you come up with the inspirations for some of your designs? I started with a very ‘destash’ mentality! A lot of my flowers/buttons/etc are remnants from my scrapbook supply hoarding. Some of the plastic headbands come with their own flair (the black and white flowered one, for example) I will soon be making my own little cabochans from Sculpy. One new headband that is in the works was literally ‘dreamed up’ while I was trying to fall asleep. How much time do you spend working on your shop? I spend as much time as I can working on headbands, but my timing is sporadic at best, due to being a new mommy to my 3-month old daughter. I am hoping as she and I settle into more of a schedule that I can devote some more time at regular intervals! What’s the first thing that you think when you see your headbands in someone’s Blythe photos? This just happened the other day, actually. I thought it was the coolest thing in the world. I just stared at my computer screen and thought, “I made those!! !” I’m really glad people enjoy them and think that they are well-done. My biggest fear was that people wouldn’t like them for some reason once they saw them in person! I kept checking to make sure they fit my girls over and over to be sure. What would you say sets your headbands apart from the others that are available? The plain plastic ones are not unique in any way, but the ribbon wrapped and decorated ones share a style all my own. Stacie of Blytheblu is one of the only others I know who does ribbon wrapped bands and her charms and decor style are her own, as mine are my own. It is mostly color selection and materials that set them apart. I love to make a ‘mess’ with all of my ribbon and charms and then just mix and match until I like a combination. I think it makes my husband crazy! What do you think is the hardest and easiest parts of owning your own business? The hardest part is keeping track of expenses and setting prices. I tend to just buy supplies like crazy and then hubby has to remind me to calculate those costs out of my profit. I find it really difficult to add the price tag to an item, and will sit starting at the screen debating between fifty cents or so! The easiest part is coming up with fun things to put in the shop. The dreaming part is all too easy sometimes. What kind of plans do you have in the future for your Etsy shop, Claribari Blythe? In the future I would like to offer sewn items as well as the headbands, but I think my sewing needs to get a bit better. I would love to do t-shirts and/or dresses that mirror some of my headband designs. If hubby and I ever manage it, we want to design and build Blythe furniture as well. Thanks so much for doing this interview with me! What kind of advice do you have for someone who’s also juggling between family life and Blythe crafting? Thank you for interviewing me! If you are a crafter, shop owner, and parent, juggling everything is hard! Don’t get discouraged if you don’t get to do things when planned. Usually you can find another opportunity to work; during naps, staying up a bit later or getting up a bit earlier, or if your spouse will help you out that goes a long way. Biggest piece of advice: Be okay with doing things in stages, because interruptions happen! 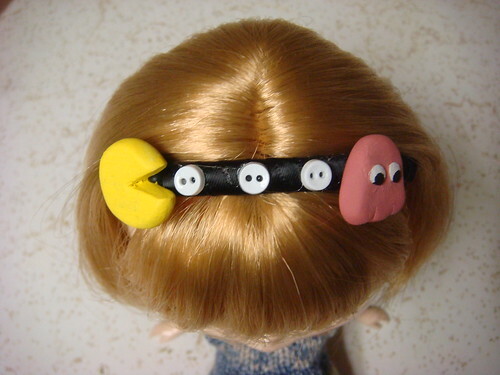 Heather is offering up one Pac-Man headband to one very lucky winner! You can get up to sixteen (16) entries for this giveaway draw and you can enter until Saturday April 2nd 2011 at 11:59pm Pacific. The draw will be held on Sunday April 3rd 2011 and the winner will be announced on BlytheLife.com. Remember to use a valid email address for all comments. If you win, your email will be forwarded to Heather for arranging shipment of the prize. Mandatory Entry: Comment below about the interview with Heather! Do you have any questions for her? This is worth 1 entry into the giveaway. Bonus Entry #2: Follow Heather’s blog RSS feed! This is worth 1 entry. Comment below to let me know that you’ve followed her blog feed! Bonus Entry #3: Blog about the contest! Be sure to include some details about the contest and include links to BlytheLife.com, this interview/giveaway page and to the Claribari shop! For 1 blog entry, this is worth 5 entries into the giveaway! You must comment below with the URL to your blog post. 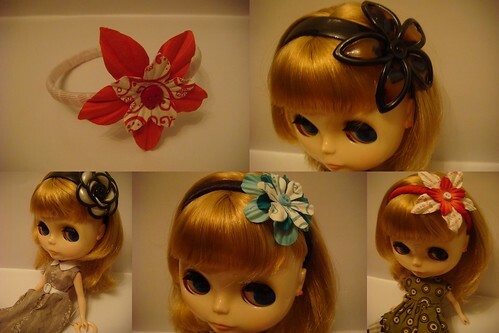 Claribari Blythe Headband Giveaway: The Winner! 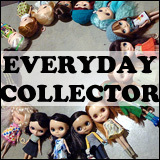 Interview with Eve of QuenneDoll & Giveaway! Interview with Atlanta of Dream Come True and Giveaway! Oh my goodness! This is so amazing! What materials do you use for your headbands? I love it! Such great ideas. Tweet 3, and I think I subscribed to the RSS. This is going to be an interesting contest if there are only 2 of us. Lol! Lovely headbands Heather I would love to win one for my girls 🙂 Great interview too. Following her blog as 222am and tweeted as noituudenaika.